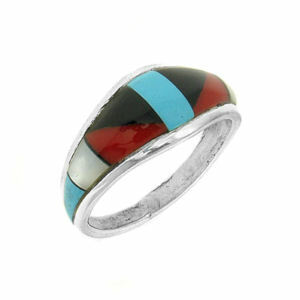 This zuni inspired ring is inlaid with turquoise, coral, black onyx and mother of pearl. This ring is stamped "Sterling." Available in sizes 6.0, 6.5, 7.5, 8.0, or 8.5, pulled at random if you are ordering in bulk.